Jim Mallinder has backed JJ Hanrahan to step up for Saints, with Stephen Myler set to miss the final two games of the season. Myler sustained a knee injury in the defeat to Saracens at Stadium MK last time out. The fly-half was forced off at half-time, with Rory Hutchinson replacing him and Harry Mallinder moving from centre to 10. But Hanrahan, who will join Munster this summer, was not on the bench that day and now appears to be the natural replacement to face Exeter Chiefs at Sandy Park on Saturday. 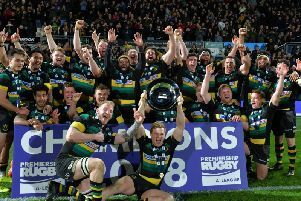 After that game, Saints will have one regular-season fixture remaining, the final-day clash with Harlequins at Franklin’s Gardens on May 6. And Hanrahan could have a key role to play in both matches as Mallinder’s men bid to secure a top-six spot that would guarantee qualification for the Champions Cup. “It’s unfortunate for Stephen because he was playing well, but we’re very, very fortunate that we’ve got someone like JJ,” Mallinder said.